Regenerative medicine holds the promise of affordable health care solutions with stem cells as the biological tools repairing and regenerating the damaged tissues of the human body. This field of medicine refers to developing completely new ways to treat and manage chronic diseases such as diabetes, infarctions, degenerative nerve, bone, joint conditions and autoimmune dysfunctions. Duchenne Muscular Dystrophies Periodontal diseases are infections of the structures around the teeth, which include the gums, periodontal ligament and alveolar bone. In severe forms of the disease, all of the tissues are involved leading to dysfunction of the entire oral environment. 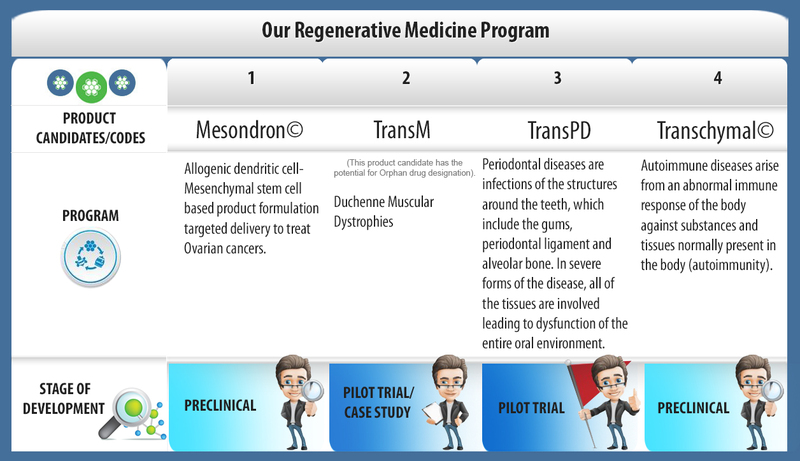 Transcell Biologics is an innovative biotech company with continuous discovery and process development as it’s central theme to deliver unique disruptive stem cell based solutions to treat chronic and debilitating..